BARNEBYA W. R. Anderson & B. Gates, Brittonia 33: 275. 1981.—Type: B. dispar (Griseb.) W. R. Anderson & B. Gates. Trees or woody vines; stipules lacking; leaves alternate or appearing opposite when leaves are crowded, the lamina bearing glands impressed in the abaxial surface. Inflorescence terminal, unbranched or with a dominant axis and many weaker axes from near base, each axis a raceme of 1–3-flowered cincinni; floriferous peduncle well developed; bracts and bracteoles eglandular. 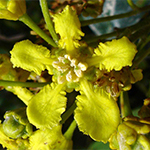 Flowers with the calyx, corolla, and androecium perigynous; sepals leaving outermost petal exposed in enlarging bud, all biglandular, some or all glands decurrent onto pedicel; corolla bilaterally symmetrical, the posterior petal different in stance and shape from the lateral 4 petals; petals yellow, glabrous or thinly sericeous abaxially on claw; receptacle bearing basifixed hairs between perianth and androecium; androecium radially symmetrical; stamens 10, all fertile; filaments distinct, alike, glabrous; anthers ± alike (those opposite sepals longer), the connective not or hardly exceeding locules; pollen radially symmetrical, with 3 (­–5) equatorial pores, lacking colpi; gynoecium radially symmetrical; carpels 3, broadly connate in ovary, all fertile; styles 3, alike, stout or slender, subulate with small subapical stigmas. Fruit dry, breaking apart into samaras separating from a pyramidal torus; samara with an elongated dorsal wing thickened on adaxial margin with veins bending toward thinner abaxial margin, the nut inflated, reticulate but unwinged on sides; banisterioid-type carpophore lacking, the samara at maturity attached to the receptacle by 2 coriaceous ribs at the margin of the areole. Chromosome number: n = (29?) 30 (W. R. Anderson, 1993a). Barnebya is as enigmatic morphologically as its placement by DNA would lead one to expect. It is one of the very few New World genera with alternate estipulate leaves. Its perigynous flowers are unique in the family, and the chromosome number is very rare. The several-flowered cincinni and subulate styles are reminiscent of the genera of the Mcvaughia clade and byrsonimoid genera; such styles and cincinni are not found in any other wing-fruited New World genus. Similarly, the radially symmetrical porate pollen suggests derivation from colporate pollen like that found in the Mcvaughia clade and byrsonimoid genera. The samara resembles that of Banisteriopsis, Stigmaphyllon, and their relatives, but unlike those genera Barnebya has its carpels broadly connate, and it lacks a basal-dorsal carpophore. Etymology: Barnebya was named in honor of Rupert Charles Barneby (1911–2000), an erudite and wonderfully productive plant taxonomist, who was a good friend to both authors.